The Narcs were an award winning New Zealand band, that formed in 1980 in Christchurch, New Zealand, by bassist Tony Waine, drummer Bob Ogilvie and guitarist Garth Sinclair – departed/replaced by Australian guitarist/singer Andy Dickson. Christchurch remained the band’s base with a series of resident club and pub gigs building their following. Touring had become a regular event for The Narcs by 1981, and the pressures of the road contributed to Bob Ogilvie leaving – being replaced by Steve Clarkson on drums in 1982. Keyboardist Liam Ryan became a full-time Narc in 1983. During a retreat at a commune the band wrote most of the songs for their debut album, Great Divide. The single, “Heart and Soul”, peaked at #4 on the NZ charts, picked up five 1984 New Zealand Music Awards and the album achieved gold disc status. The band worked in both in NZ and Australia, recording a total of four albums and playing alongside such acts as Midnight Oil, Split Enz, Elton John and Queen. 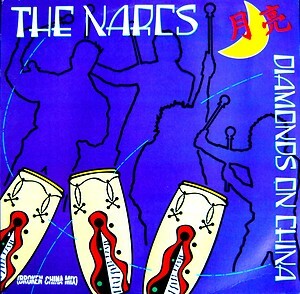 The Narcs were one of the first Kiwi acts, apart from Split Enz, to have records released worldwide. “Diamonds On China” was the first single of the band’s self-titled second album and the 12″ single added a remix of previous single “Lazy Susan”, it would reach #15 in the NZ charts.